A variety of team building programs can be designed utilizing the 4-H Center Challenge Course. The 4-H Center offers cooperation and team building programs for youth, adolescents, and adults. The primary purpose of these programs is to challenge members of a group to overcome a series of obstacles by working together. All programs are conducted on-site at the 4-H Center Challenge Course, which consists of an outdoor pavilion, low ropes course and zip line. This course is physically, mentally, and emotionally challenging. All facilitation, instruction, and equipment are provided by the 4-H Center. The Low Ropes Course includes eleven unique training elements designed to teach group cooperation and communication both physically and mentally. It pushes participants to use and incorporate positive team attributes. Includes certified facilitator; minimum group of 6 and maximum group of 12 participants per facilitator. Additional facilitators can be provided for larger groups. 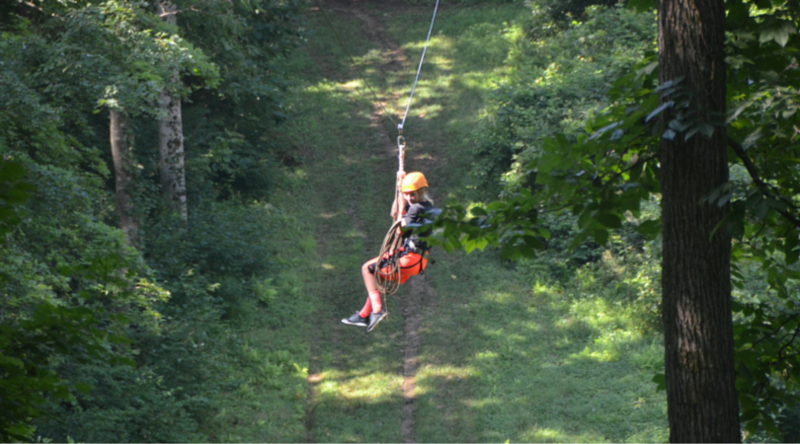 The High Ropes Course, which includes a zip line, climbing wall, and rappelling, is designed for participants to learn about self-challenge, safe risk-taking, trust-building, assurance, and self-confidence. Includes certified facilitator; minimum group of 6 and maximum group of 12 participants per facilitator. Additional facilitators can be provided for larger groups. Team Building Initiatives introduce the concept of teamwork and positively reinforce the value of each participant. Through these activities, participants learn how to cooperate, communicate, trust their peers, and effectively support one another.